The Wildlife Conservation Section of Georgia DNR's Wildlife Resources Division offers a $1,000 grant to a third-, fourth- or fifth-grade teacher who demonstrates exceptional energy and innovation in teaching life sciences. Project proposals must include Georgia’s native animals, plants and habitats as the context for learning curriculum standards. One teacher is selected based on project design and how well the grant proposal questions are answered. Funding is made available by The Environmental Resources Network. TERN is the friends group of the Wildlife Conservation Section. 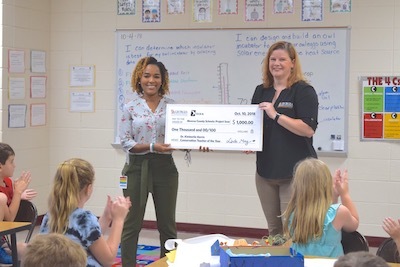 The 2018 grant was awarded to Dr. Kimberlie Harris, a gifted teacher at Monroe County Schools. Harris was selected for her EcoTeam to the Rescue: Endangered Animals of Georgia proposal. As a language arts teacher, she partnered with a science teacher to develop the project. After choosing a rare species in Georgia, each of her third-grade students researched their animal and gave a presentation about its life history and threats to survival. These projects inspired the students to do something locally to help wildlife. Application Deadline: September 17, 2018 (e-mailed or postmarked by). My grant proposal promotes the understanding of environmental issues facing wildlife (animals and plants) and Georgia habitats. My grant proposal does not seek more than $1,000. If funded, I commit to follow-up communication with GA DNR Nongame staff concerning the execution of this grant, including a brief final report. Media to accompany this report (photos, video, PowerPoint, etc.) is encouraged. I understand that my project(s) must include ADULT supervision on school grounds. Grant funds may not be used to cover transportation costs (buses, gasoline, etc.). My principal or director has approved this project. I have viewed the application’s scoring rubric (point-weighted questions) and understand the guidelines that will be used to score my application. If funded, I understand that a check will be made out to my school/organization. Winner will be notified by October 5, 2018 and funds awarded soon thereafter. Grant funds must be spent by May 31, 2019. If funded, I agree to submit a final report to DNR postmarked by June 15, 2019. All receipts must be submitted with final report. The Wildlife Conservation Section of Georgia DNR's Wildlife Resources Division offers a $1,000 grant to a third-, fourth- or fifth-grade teacher who demonstrates exceptional energy and innovation in teaching life sciences.